Before we began, we were offered some of craft Japanese themed cocktails, curated by Erwann Heusaff. 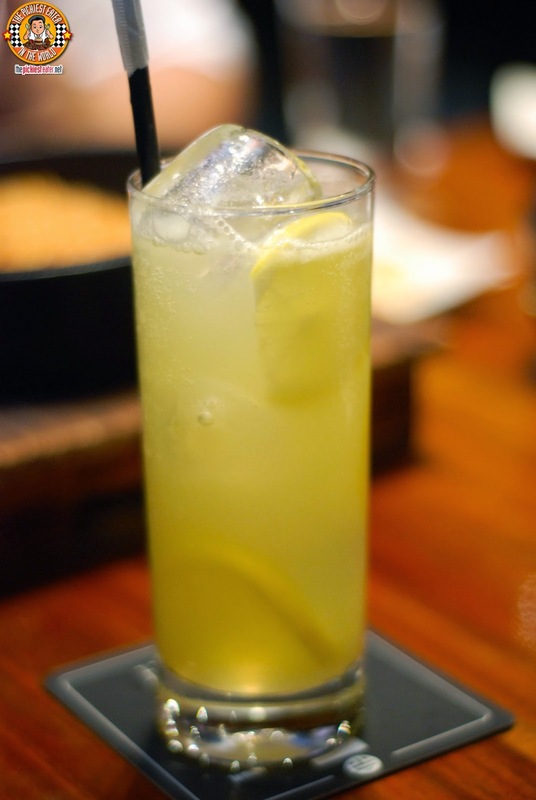 Rina decided to try the Honshea (P220), which was Sake mixed with bit of Lemonade, spiked with a bit of lemon juice, with some lemon wedges added for good measure. My other friends ordered the Kiyohime (P220), which is Ice Tea with a bit of a kick. 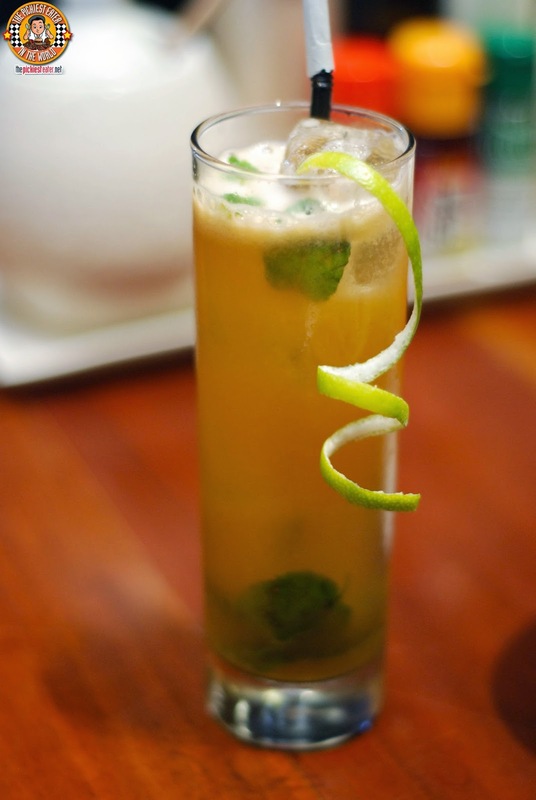 Yabu's Ice Tea Blend is mixed with a bit of Sochu, then some lime for some zest. Finally, a few mint leaves gives the flavor a nice refreshing twist. So I skipped then drinks and immediately got to business. 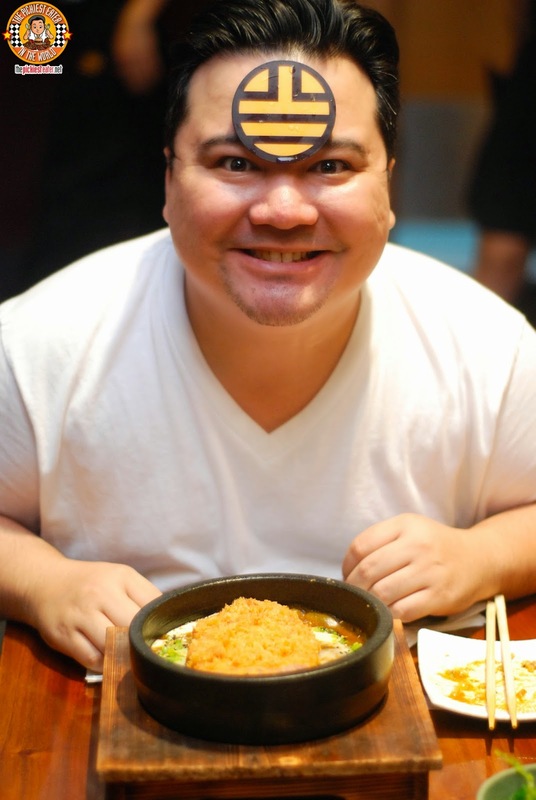 My eyes were set on Yabu's new Donburi Sets. The Donburis are served in a gorgeous hot stone pot that maintains the heat so well, that wooden cases had to be crafted in order to keep the bottom of the bowl from heating up the table during testing. The first of the "Dons" that I tried was the Katsu Curry Don. 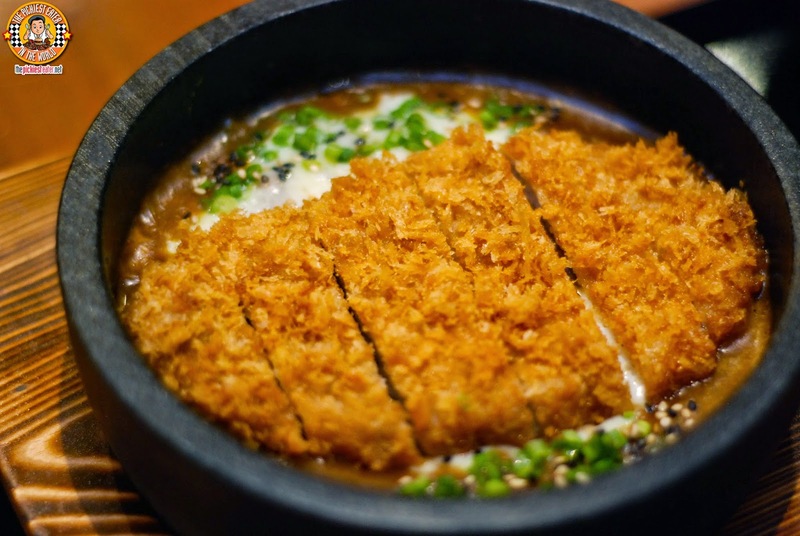 I know what you're thinking - Yabu already has Curry dishes. and yes,you are technically correct. But not a curry dish like this. 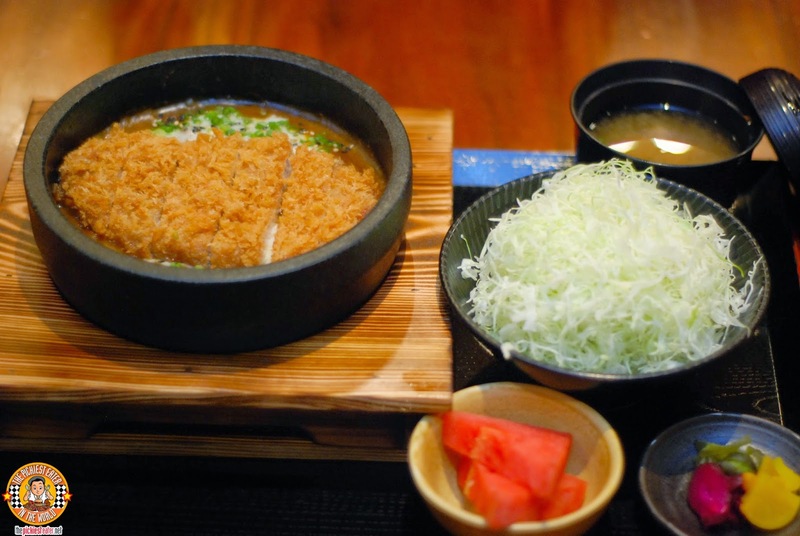 The fragrant curry sauce that Yabu is famous for, is mixed in with minced beef, giving it an extra punch of savoriness. And the coup de grace is the infusion of melted mozzarella into the curry sauce, giving a nice cream counter to the subtle heat of the Curry. People that like their curry with more heat can opt to have the level of spiciness elevated to either "Hot" or "Very Hot". See? The sauce is so good that I didn't even mention that it's topped with the Katsu of your choice (See the menu below)!! That's because the sauce on the rice is a meal in itself, but I loved how how perfectly it goes with the delicious Rosu, making a phenomenal Rosu Curry Katsu Don (P480). The Donburi Set Meal includes Miso Soup, Japanese Pickles, Cabbage with your choice of dressing, a bowl of fresh fruit for dessert and, every pinoy's favorite restaurant feature.. "Unlimited Rice" (white or brown). 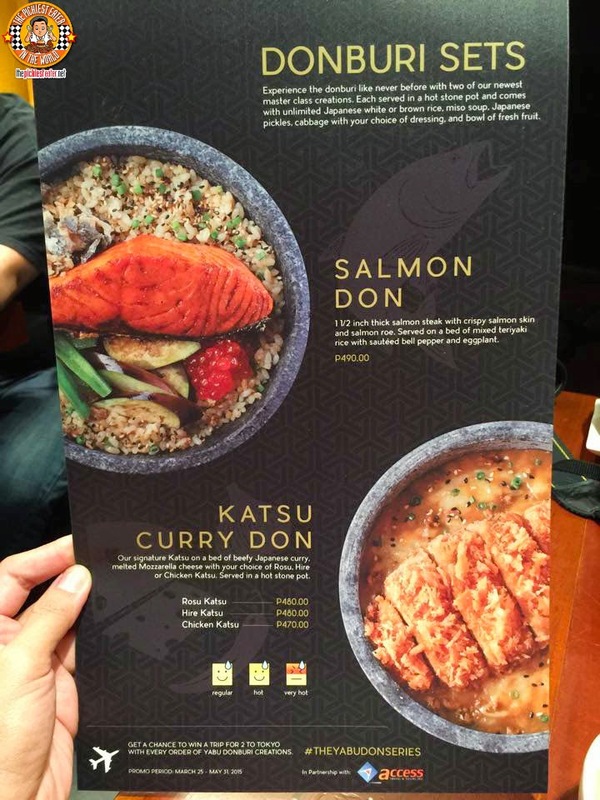 Watch me creep out my wife..
You know, I was actually considering not trying Yabu's new Salmon Don (P490)? I was actually starting to get really full from all the Rosu Katsu Curry I demolished, so I was gonna leave this all up to Rina. After one bite, Rina told me that if I didn't give this Salmon Don a try, I was a bigger idiot than she thought I was. And she was right. It was absolutely magnificent. A 1 1/2 Inch Salmon Steak is perched on top of an amazing mixed Teriyaki rice, mixed with bell peppers and eggplant. I would say the crispy Salmon Skin is what won me over. Words cannot express how excellently this fish was cooked. It almost makes you think that if heaven had a cafeteria, this is what they'd be serving to the angels during their lunch break. 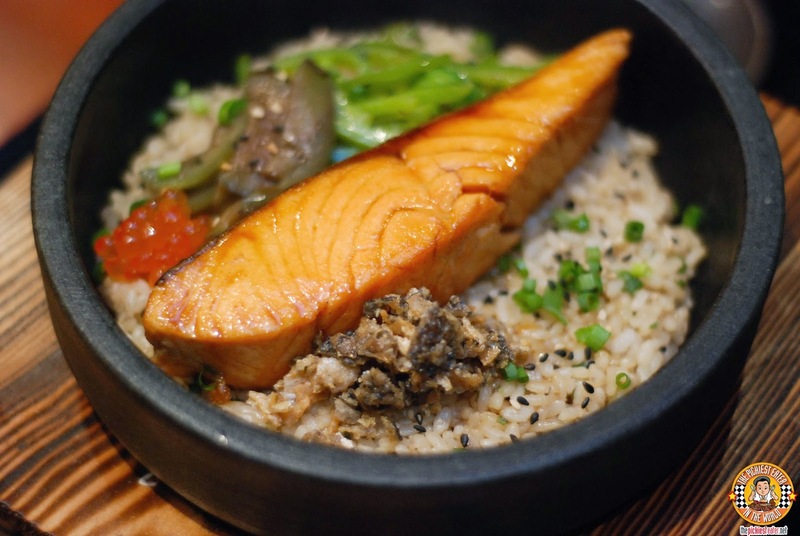 But it doesn't stop there, the salmon meat practically melts in your mouth, making it easy to mash into the rice. And that rice. Don't get me started on that rice!!! The mixed Teriyaki rice gave a gentle touch of sweetness that melded well with the taste of the natural flavor of the salmon. 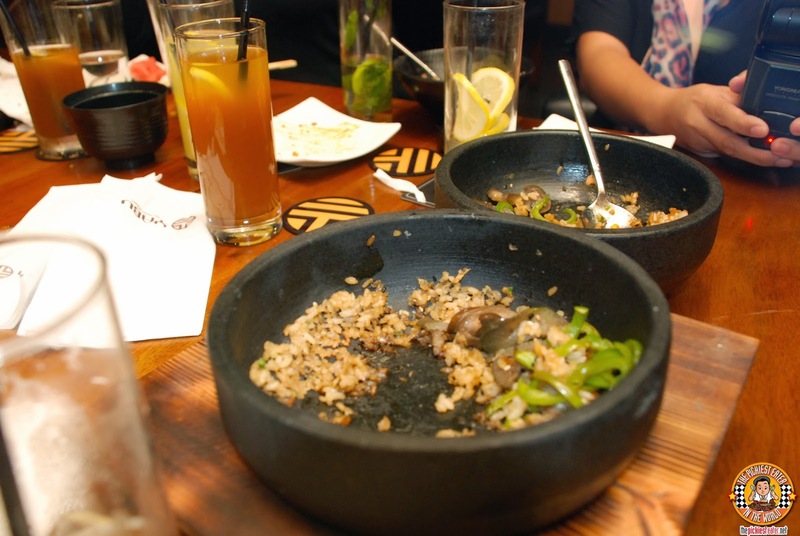 I loved how the bottom of the stone bowl allowed for a bit of burnt rice bits (tutong) to caramelize, leaving you to scrape it out. I swear, I scraped the bottom of the bowl so hard, I thought I was scraping the top of the table already. But that's how badly I wanted the tutong! The Salmon is served with a sprinkling of Salmon Roe, but I kinda avoided it, as I'm not too keen on eating fish eggs. And as you can imagine, pretty soon almost all our bowls were empty! 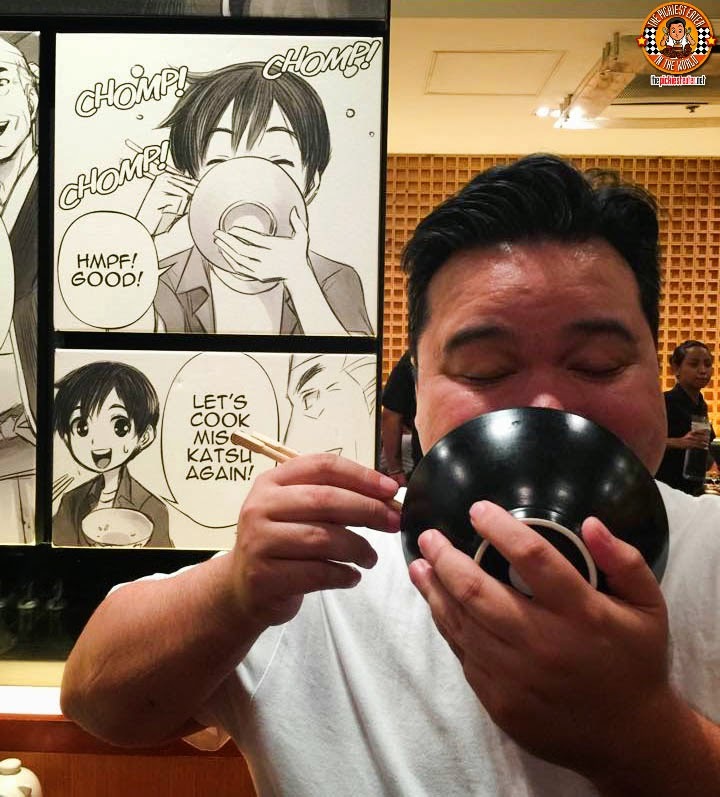 The lovely Candice (whom I tormented all night), explained to me that the unveiling of the new Don bowls of Yabu came with an exciting new promo! 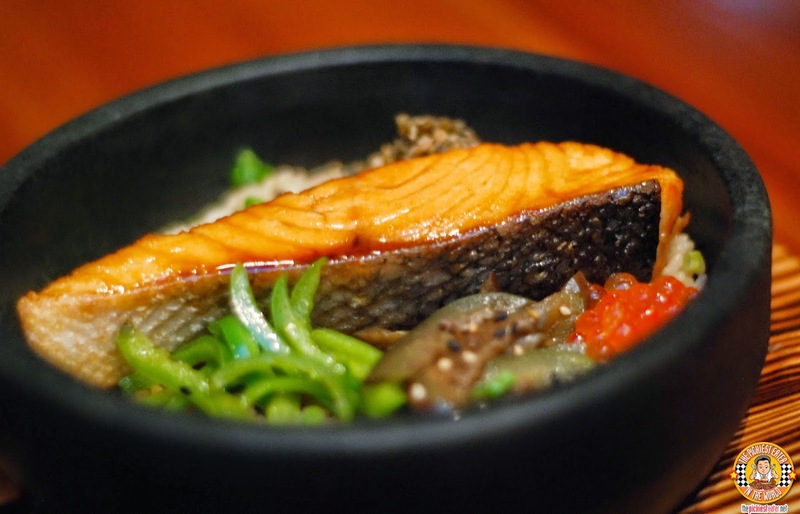 Every order of the Donburi Bowl from March 25 to May 31 will entitle you to a raffle ticket. The winner of the grand draw will win a trip for 2 to Tokyo, Japan!! Hahahaha.. 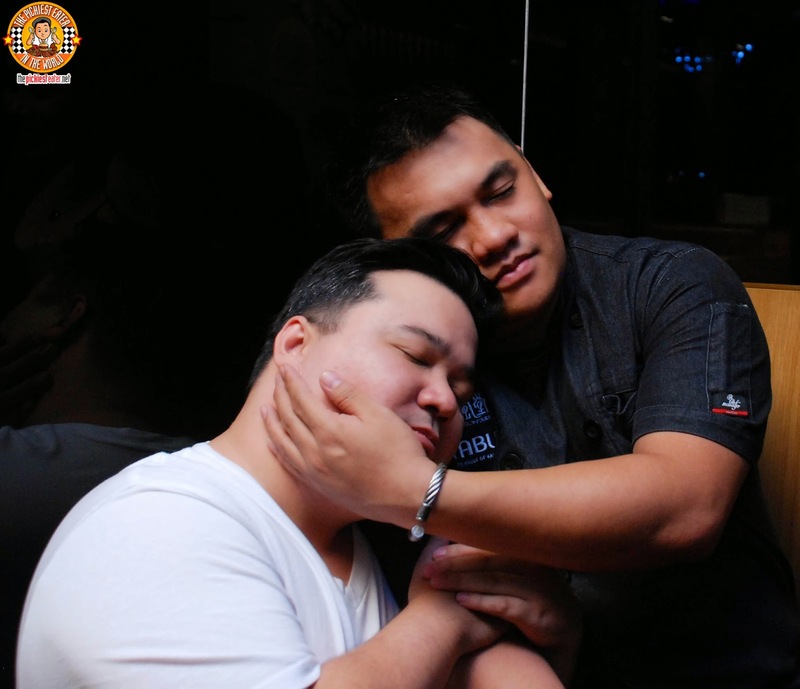 I love your photo with the chef. Movie-poster worthy even! 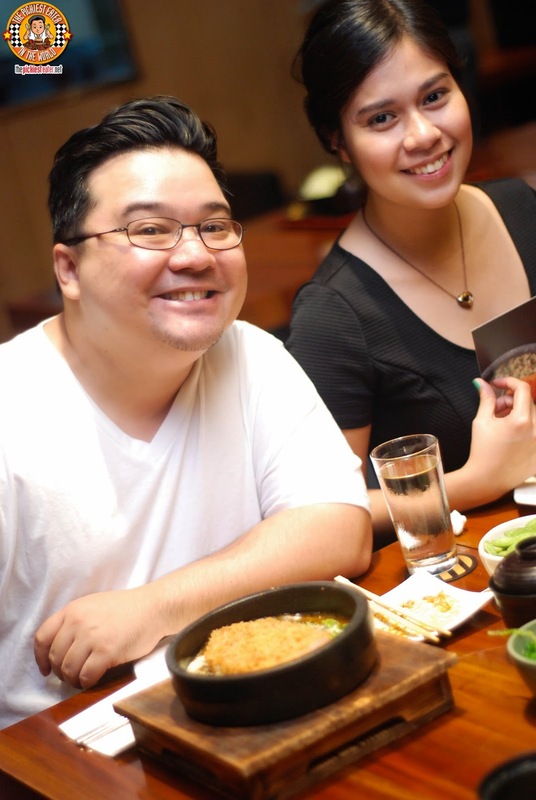 I've only been to Yabu once, that was in their MOA branch. I do remember falling in love though. Come to think of it, I've never been to their Glorietta branch (slaps forehead), which is weird because I live in Makati. I am definitely going there one of these days to try the salmon don. you definitely should Marj!! It's excellent! Wow! I am excited to try out their new dishes and get a chance to win a trip to Tokyo, Japan. :) The salmon roe sounds like a must-try! The Curry was really good as well!! Jeng if you win the trip to japan, mine nalang prize mo ha? you're going naman next month.. give chance naman to others!! Thank you for having me, Sir Gerry!